Everyone is in a good mood when fall arrives. You still have your vacation buzz from summer, but you’re pumped to start the new season with gusto. Getting engaged will leave something bright to hold on to, especially when dreary winter hits! Cute-out in matching flannels, or pose in a pile of colorful leaves. Doing your engagement photos in this season is undoubtedly the most fun! There’s so much style to play with, you won’t run out of ideas. You can’t top an autumn engagement party. Decorate with hay bales, gourds, and fall colors; celebrate with your friends and family to a bonfire or Halloween party! 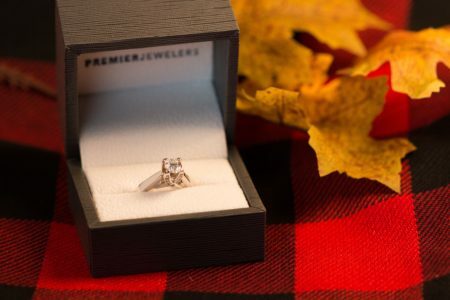 Thinking of popping the question this fall? What about surprising her at your local cider mill, or getting down on one knee during a hay ride? The possibilities are endless this season, so take advantage of beautiful weather!